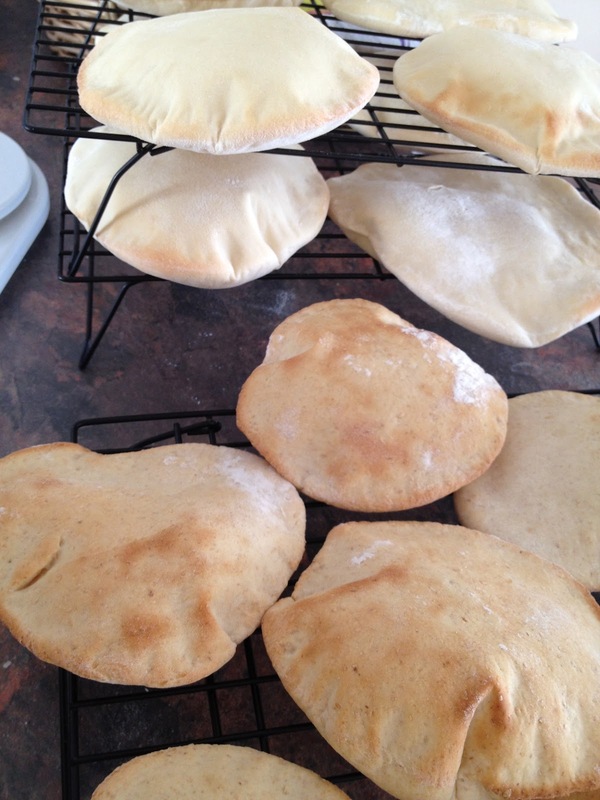 Pita Pockets. Beautiful bag of nothing.... fill it up! 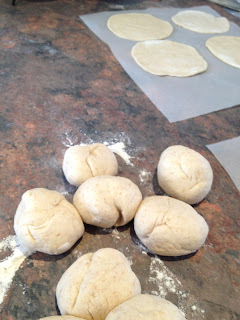 The original is from this blog and use this if you want non-Thermomix instructions. I made 8 medium-sized Pita Pockets and then did another batch with Wholemeal flour and made 16 smaller pockets. They both worked quite well. 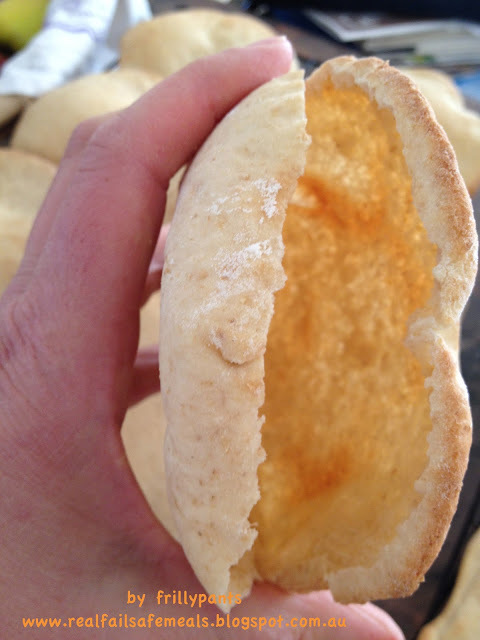 The uses for Pita Pockets are many. We had them for lunch, with cream cheese and salady bits inside. You can fill it anyway you like! Or tear it up to use it to eat dips like hummus. I even mixed together some cream cheese and No-Tomato sauce and got a whole new sandwich 'condiment' spread! Another Failsafer said she planned to use them for tacos. I was impressed!! Put warm Water and Yeast into TMX and mix Speed 2 for 5 seconds and then leave about 5 minutes. Add 250g of Flour and the Salt and mix on Speed 4 for 5 seconds. Add remaining Flour and Knead on Interval speed for 4.5 minutes. Then flatten each ball with a rolling pin (I actually used one of my children's toy rolling pins and it worked very well) until about 5mm thick. Do try to keep the thickness consistent. Alow to cool on a rack and store in an airtight container or bag. May be frozen. Our lunch time ones just disappeared. One benefit is that the bits don't fall out of them while being handled by the 2-y.o and the same 2-y.o has no trouble getting his little mouth around it. At dinner I served them spread with some melted garlic butter. Gone in a flash!! No tweeks, apart from the wholemeal angle. And, as I mentioned, I hope Kersten manages to do it GF. The metric system is simple in that one ml (measure) of water is equal to 1 gram (weight). Or, 1 litre is equal to 1 kilogram. Same other similarly weighted liquids. (eg milk, wine etc). Of course, whether measuring flour or water or bricks, 1 gram is always one gram. According to Google, 310 grams is equal to 10.93 ounces.